In the history of Buffalo there has been nothing to match the building of the first harbor here as an exhibition of public spirit and a demonstration of what powerful leadership can do for the Community. The pier was completed, and the creek carried by a new and straight, although shallow, channel into the lake. 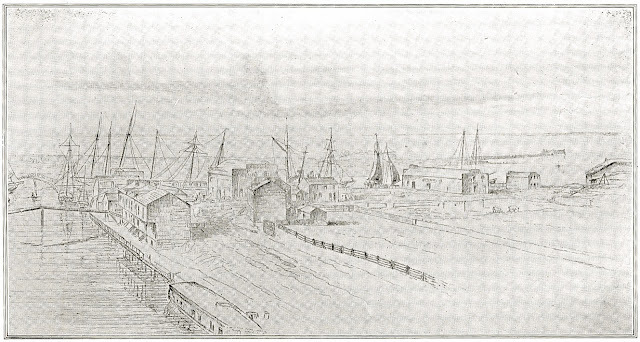 The fact that the pier built in 1820 had endured the storms of one winter uninjured, encouraged the company to believe that the outer pier, although more exposed, would, by being better secured, prove strong enough to resist the swells, and in future protect the channel from the moving sands which had yearly barred it up. It was expected that the spring freshet would so widen and deepen the channel as to permit the lake vessels and even the Walk-in-the-Water (the only steamboat on the lake), to enter safely. This boat had been built at Black Rock, and run to that place, not ever touching at Buffalo. It was a source of annoyance to Buffalonians that this fine steamboat passed their village on each voyage but never stopped there, so the very prospect of having a steamboat arrive and depart from Buffalo, was highly encouraging. 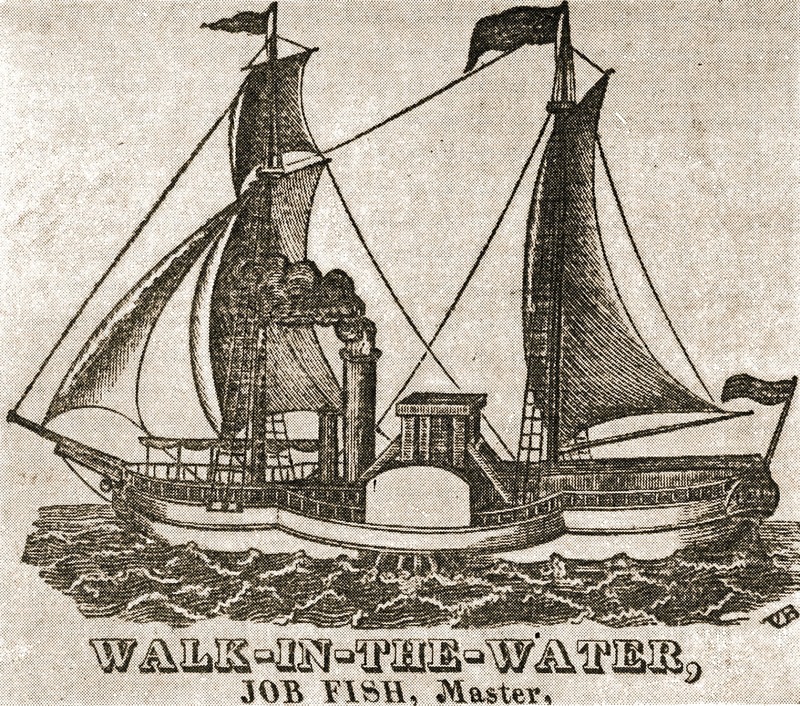 Named in honor of a great Wyandot chieftain, the Walk-in-the-Water sailed on her maiden voyage on Aug. 15, 1818, carrying 29 passengers for Erie, Grand River, Cleveland, Sandusky and Detroit. She reached Detroit over this course in 44 hours and 10 minutes, developing a speed of about 7 1/2 miles an hour. Like Robert's Clermont, upon which she was patterned, she used sails in fair weather to save fuel. (First Hybrid?-Ed.) Under command of Capt. 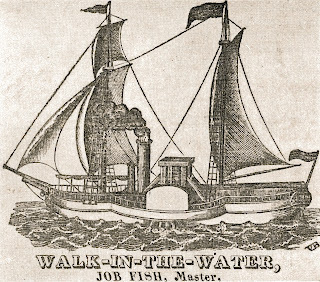 Job Fish, the Walk-in-The-Water earned a handsome profit for her owners. They knew the vessel still required the help of Capt. 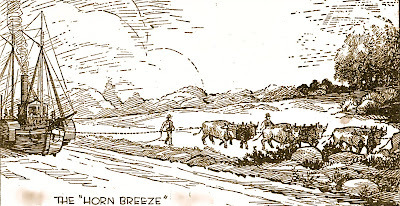 Thompson's "Horn Breeze" to breast the current of the Niagara and gain the waters of the lake from her home port of Black Rock. They argued that Buffalo's harbor, entering directly upon the lake, would be a more economical and efficient base of operations for the ship. 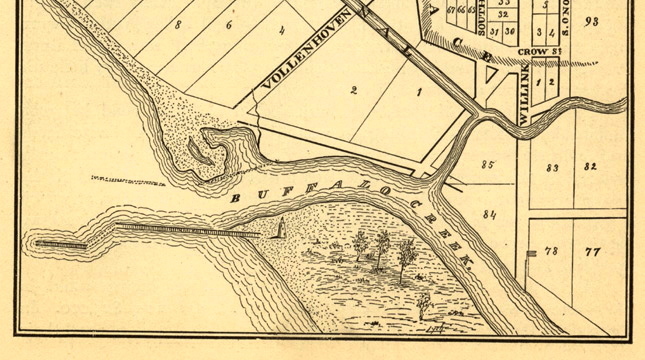 But on her last voyage of the season in 1821, the year the new channel for Buffalo Creek was completed, the Walk-in-the-Water left Black Rock. In the night a furious gale arose and Captain Rogers, who was then in command, put back, but was not able to get into Buffalo Creek. The captain, seeing the impossibility of saving the steamer, ordered her beached. With skilled seamanship she was sent broadside on. A rope was stretched from boat to beach, and the passengers were ferried to shore in the small boat. Salvage workers saved her engines, boilers and furniture but the ship it self was lost. 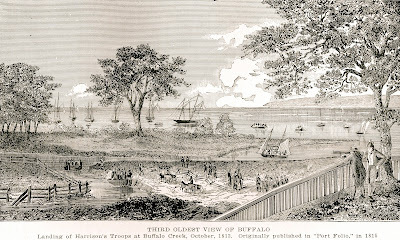 The wreck of the vessel ended the hope of Buffalo bringing the Walk-in-the-Water to the new harbor, but gave rise to another. With the engines and fittings of the ship salvaged, it was expected the owners would build another. If the vessel was to be built in Buffalo, the role of the village as a port would be recognized and a thriving shipbuilding industry would be established. 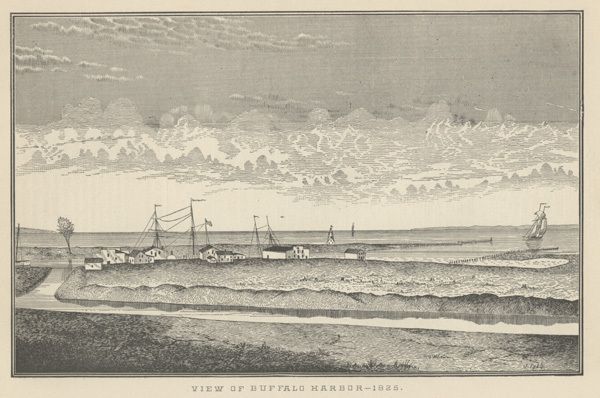 The citizens of Buffalo, without loss of time, addressed the directors of the company, presenting the advantages that would accrue to them by building their boat at Buffalo. The company, immediately on learning of their loss, made a contract with Noah Brown & Brothers, of New York, to build a boat at Buffalo, if it could be constructed as cheaply there as at the Rock, and if there could be certainty of getting the boat out of the creek. Mansion House, white building on right. 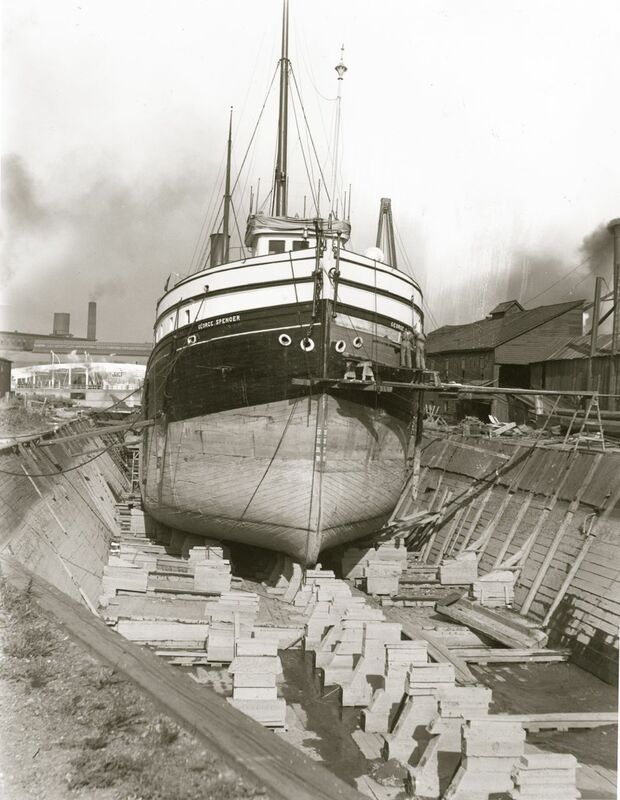 Brown came on early in January, passing on to Black Rock without even reporting himself in Buffalo, nor was his arrival known here until he had agreed to build his boat at the Rock, and engaged the ship-carpenters of that place to furnish the timber. 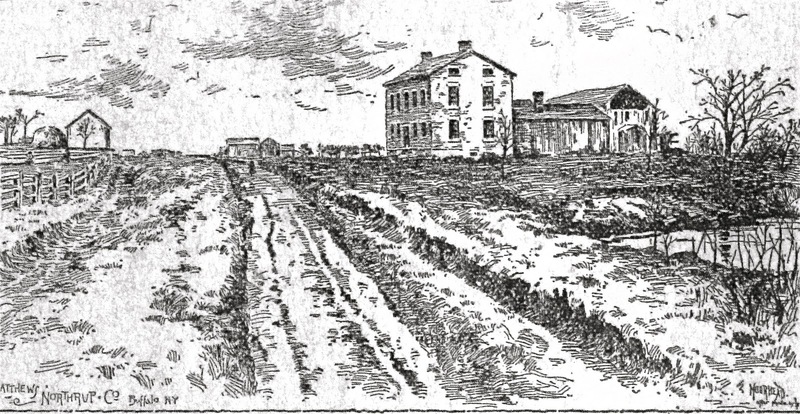 The Black Rock contractors, gratified with their success, agreed to accommodate Brown by meeting him at the Mansion House in Buffalo in the evening to execute the contract. Thus, Brown's hands almost were tied before anyone in Buffalo knew what was going on. But the news leaked out. Sam Wilkeson and most Buffalo citizens were incensed. 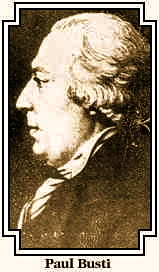 They gathered in the bar-room of the Mansion House and demanded an immediate interview with Brown. "Mr. Brown, why do you not build your boat at Buffalo, pursuant to the wishes of the company?" "Why, sir, I arrived in your village while your people were sleeping, and being obliged to limit my stay here to one day. I thought to improve the early part of the morning by commencing my inquiries at Black Rock and consulting the ship-carpenters residing there, who had aided in building the Walk-in-the-Water. While there, I was told that your harbor is all a humbug, and that if I were to build the boat in Buffalo Creek, she could not be got into the lake in the spring and perhaps never. 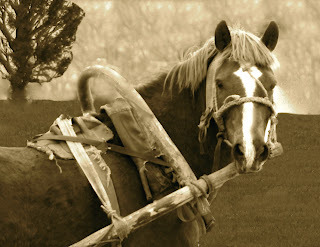 Besides, the carpenters refused to deliver the timber at Buffalo. "Mr. Brown, our neighbors have done us great injury, although they no doubt, honestly believe what they have said to you about our harbor. 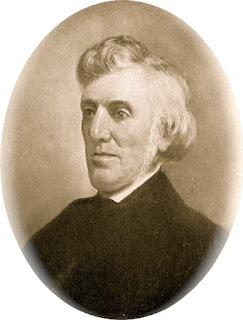 "Under the circumstances, I feel justified in making you a proposition which will enable you to comply with the wishes of the steamboat company, and do justice to Buffalo without exposing yourself to loss or blame. 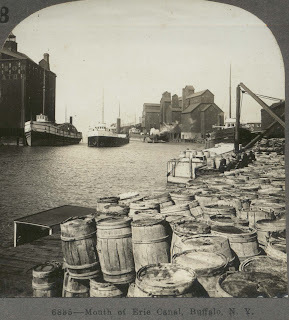 The citizens of Buffalo will deliver suitable timber at a quarter less than it will cost you at the Rock, and execute a judgment bond to pay to the steamboat company $150 for every day's detention of the boat in the creek after the first of May." Mr. Brown accepted the proposition and the judgement bond was signed the next day. Despite the great risk involved, Buffalonians were delighted. Securing the shipbuilding contract was a genuine triumph. 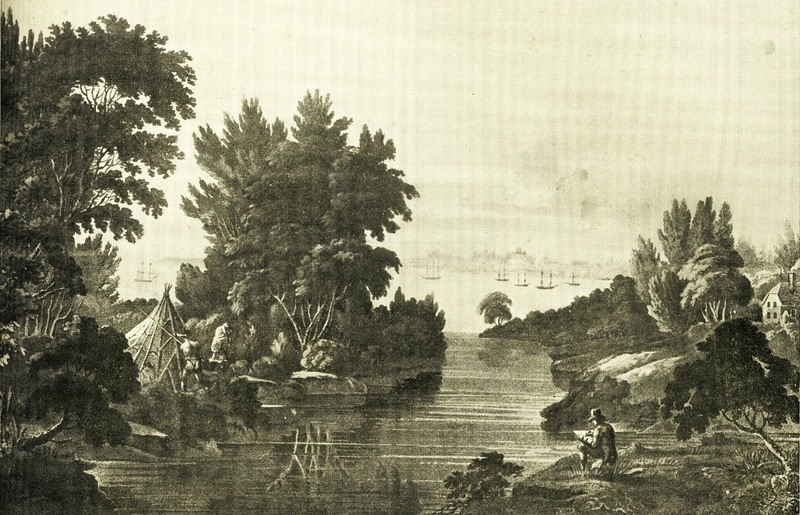 It so encouraged Wilkeson and his group they decided immediately to send an agent to DeWitt Clinton, president of the Erie Canal Board, to inform him Buffalo harbor had been completed and to urge that the canal be extended immediately to Buffalo. At the same time, the agent was instructed to tell Clinton that Buffalo "had established a shipyard." 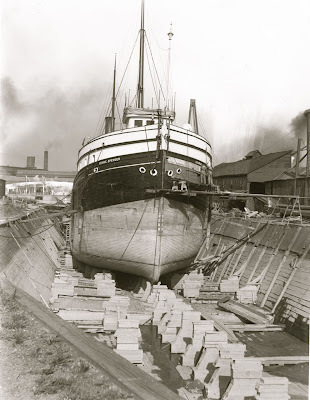 With the engines, boilers and fittings of the ill-fated Walk-in-the-Water on hand, the shipbuilders began their work. The new vessel was to be called the Superior and news of its progress was watched with vital interest in the village. The work went on all winter. There appeared little doubt that the vessel would be ready to enter the lake on the required date. Much depended upon whether the spring freshets would cut the channel to the required depth. The flood came but with it, as so often through the entire harbor building operation, came disaster. The trouble stemmed from a solid block of ice which rose from the lake floor to above the surface. The ice extended from the western end of the pier to the shore. Throughout the winter, it blocked the current of the creek. The ice still had not melted when the first flood came. It removed a large body of sand and gravel, and opened a deep, wide channel from the creek to the lake. But where the creek flowed into the lake, the ice blocked its path and the sand and gravel piled into a new bar that extended for more than 300 feet. The news stunned the village. At the last moment, the final proof of the worth of Buffalo's harbor had been stayed by a malicious prank of nature. The channel was blocked and the Superior was imprisoned in the creek. May 1 was approaching rapidly. Unless the channel was cleared, and the ship floated free by that date, it would cost the signers of the agreement $150 per day in penalties or $24,000 "for the summer." 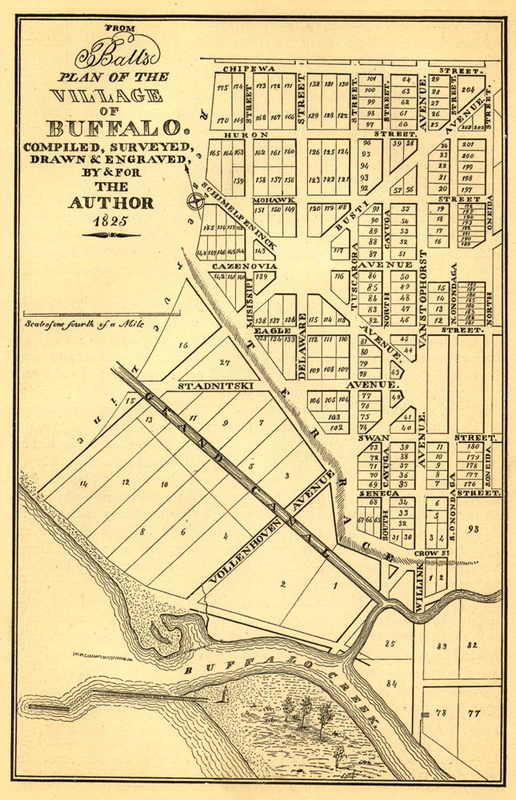 As hard to bear was the thought that Black Rock's low opinion of Buffalo harbor would be vindicated 'and' that the Erie Canal commissioners would be convinced of the hopelessness of the effort and vote to terminate the canal at Black Rock. Sam Wilkeson was away from Buffalo when the disaster became known. News was sent to him and he hurried home. He arrived about the middle of March. The same day, a general meeting of citizens was called. The cost of dredging the channel was estimated at $1,600 and a fund drive was launched. But only $300 was pledged. Wilkeson did not wait for more. It was necessary, he said, to begin at once and to work every day, regardless of weather, if the obstruction was to be cleared by May 1. About 25 laborers were immediately collected. No dredging equipment was available. Wilkeson improvised a substitute. The pile driver prepared for use, and a line of piles driven, 200 feet from the pier, on the north side of that part of the channel which was obstructed. Two harbor-scows were made fast to these piles, and a platform of timber and plank extended over them. Four capstans were set up in these scows about 20 feet apart. Scrapers were made of oak plank with bevelled edges shod with iron. These were loaded with scrap, so they would sink, and then dragged back and forth across the bar-by means of ropes and wind-lasses, held in place by driven piles. 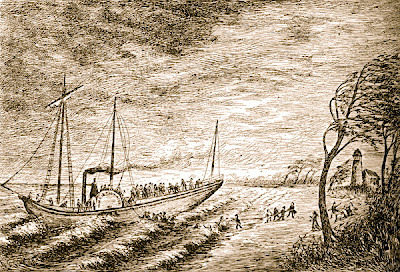 Two men stationed on the pier could, by the small ropes, pull back the four scrapers as fast as they could be drawn home by the men at the four windlasses, each of which was worked by four men at the levers, and one to handle the rope. The men could work dry, but the labor was excessively exhausting. The crude mechanism worked-well, and other capstans were prepared for use. For three days the work was unobstructed. Saturday night came and the workmen were dismissed until Monday morning. During the night a heavy gale set in, and increased in violence until about noon on the Sabbath when the ice began to break up, and the lake to rise. Soon the ice was in motion, and driving in from the lake, was carried up the creek with such force as to destroy the scows and all the fixtures. The pile driver, being securely fastened by strong rigging to the piles, it was hoped would remain safe, but the fasts gave way, and it was driving towards shore where it could scarcely escape destruction. It was saved by the extraordinary exertions of two individuals who (making their way to it by the aid of two boards each, which they pushed forward alternately over the floating ice agitated by the swells), succeeded in fastening it with a hawser to a pile near which it was floating. This was not done without imminent hazard to the men, who, several times losing their position on the board, came near being crushed by the moving mass of ice. The scow being secured, the anxious and disheartened citizens and workmen retired to their homes. The situation was now desperate, more money was needed. Wilkeson again called together those who had signed the indemnity bond and demanded action. To fail this time meant certain ruin. A list was circulated and $1,361.25 in cash was raised. In addition "a certain cow with white head" and "100 pounds pork when called for" were promised. But the work, could not be resumed at once. From the day of the meeting to the middle, of April, there were only two days without snow or rain and work was impossible. On April 15, the weather cleared and, remained good to the end of the month. The work picked up at a frantic pace. Once again Sam Wilkeson was at the heart of the challenge. Once again the destiny of the village rested in his hands. He drove himself as unsparingly as he drove his men. Tuesday morning two rows of piles were put down, on which to erect platforms in place of scows and rafts, which had been destroyed. These platforms were raised several feet above the water to protect the workmen from the spray of the swells which broke against the piles. Six scrapers were got in motion during the day, and notwithstanding the laborers were exposed to a heavy rain, rapid progress was made in removing the sand. Although the heavy swells, which continued to roll in from the lake, rendered it difficult to keep the empty scrapers in line, yet they carried the sand, removed from the channel, towards the shore, and prevented its accumulation. The laborers continued their work without returning to the shore until dark, eating their precooked dinners where they stood. The labor was so hard, and the exposure so great, that it was difficult to obtain the necessary help; indeed it would have been impossible but for the labor furnished by the citizens, many of whom sent their hired men for a day or more until their places could be supplied. So the crews labored from dawn to dusk and slowly the sludge was cleared from the channel. But when May 1 came there were still about 40 feet of channel which had been cleared only to a depth of 6 1/2 feet. By this time the owners of the Superior were in Buffalo, demanding the agreement be met. They did not seem overly concerned with the possibility of their ship sticking in the sand. The $150 per day indemnity was more than the vessel would earn in lake traffic and they could afford to take the risk. 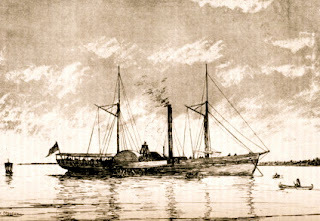 The pilot of the Superior, Captain Miller, had no intention, however, of running his ship aground on its maiden voyage. The boat was put in motion, and fortunately the pilot, Captain Miller, having made himself acquainted with what channel there was, ran her out into the lake without difficulty. The bond was cancelled! From the shore, a cheer went up. Buffalo born, Buffalo built, there the Superior floated, the symbol of a new age for the village which finally had won through over its old rival, Black Rock. The boat was, however, light; and when fully loaded would require much more water. The scraping was, therefore, continued. "When the boat was finished, the citizens were invited to take an excursion on the lake. It was feared that if the boat should be deeply loaded with passengers, she would ground in the new-made channel. Although this would be a trifling occurrence in itself, yet circumstances had recently occurred which led them to regard the experiment with the deepest, anxiety. 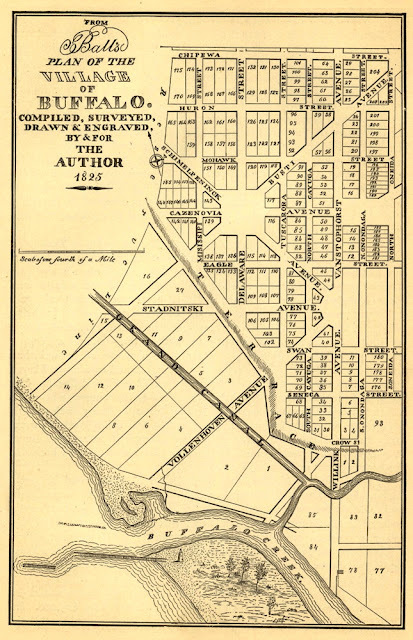 An act had passed a few days before, authorizing the canal board to contract for the construction of a harbor at Black Rock, which if completed, might secure the termination of the canal at that place, and supersede Buffalo harbor. The subject was to be acted on by the canal board in a few days, and even so trifling an incident as the grounding of a steamboat might influence their decision, and deprive Buffalo of the fruits of all her toils and exertions in building a harbor." "An effort was, therefore, made either to postpone the steamboat excursion, or limit the number of passengers, but in vain. Neither the captain, nor a majority of the citizens, could appreciate the solicitude of the few. The whole village crowded on board, and the boat grounded. This was the more mortifying, as many of our Black Rock friends were on board, who had always predicted our failure. But after a few minutes' delay in landing some of the people on the pier, the boat moved forward, went alongside of the pier, took on the passengers, and proceeded up the lake, with bugles sounding and banners flying." THE END. But really, it was only the Beginning. Ed. 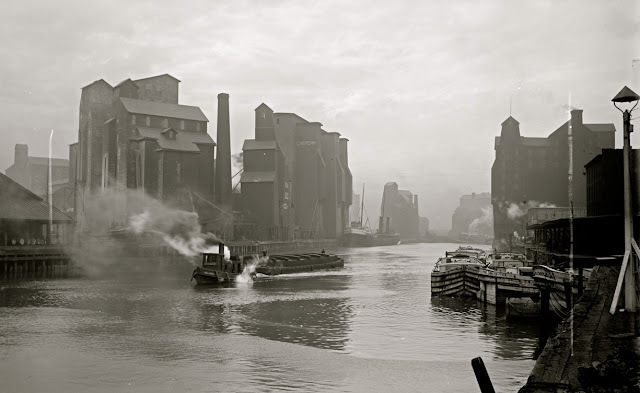 - I may write a post-log to this story, because actually Black Rock didn't give up in it's efforts to gain the Erie Canal Terminus, even after Buffalo Got it's Harbor. (Ed.) So now you know who Sam Wilkeson was, and why the house which was torn down recently for a parking area for trucks, was so important to save. It could have been moved. Buffalo, almost 200 years after this historic event, had a physical connection to this man who virtually jump started Buffalo when it could have been easily left behind. 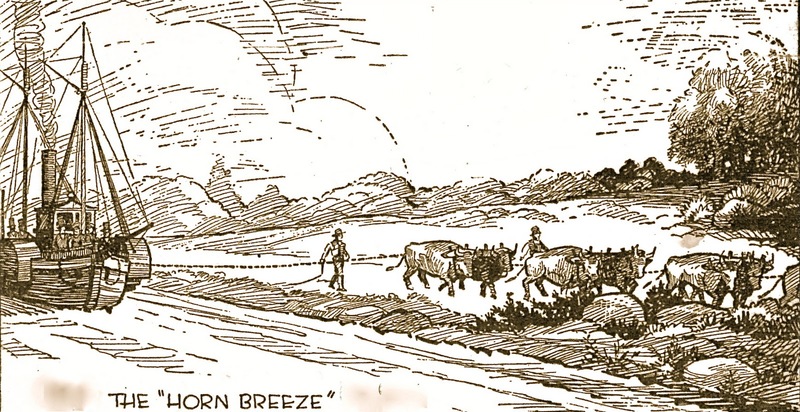 Together, while being beaten down by the weather, financial and legal difficulties, Wilkeson rallied Buffalo against all odds, and gave Buffalo what it needed the most, with no financial gain for himself. Not even Joseph Ellicott would support their efforts. Yet he sacrificed everything he owned to get the job done to put Buffalo on the map. And this was just one of the many episodes in his life. More needs to be done to recognize him, somewhere on the inner harbor. I will be adding additional biographical info about Wilkeson to this page in the near future. 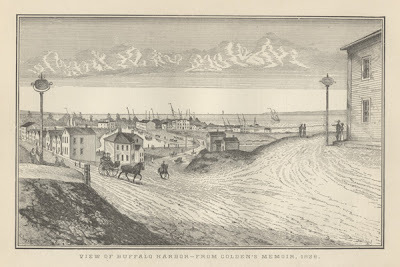 The development of Buffalo as a city has been inseparable from the development of its harbor. The building of that harbor was a turning point in Buffalo's fortunes unlike any subsequent event in the City's history. The winter was bitter. Storms beat with unremitting fury against the newly built pier. Snow fell upon snow. The waters of the lake rolled in frigid agony. Ice jammed against the cribs and timbers. In the village, the homes and stores were almost lost in the drifts. The loose top snow curled and twisted in the wind, like white smoke. 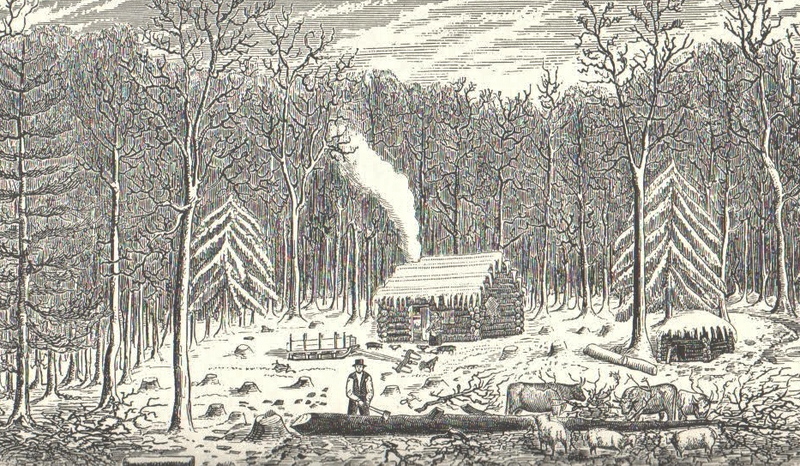 Logs burned steadily in fireplaces and the villagers stayed close to home. December passed into January and the bleakness of February. And still the bitter blasts blew across the waters. But in March the wind lost its icy edge. The ice floated free in the water, tinkling like broken glass as the floes nudged each other in the trough of waves and broke into fragments. Then April grass and leaves showed green against the earth and the branches of trees. The wind sighed. As it passed through the village it rustled the buds and carried the smell of earth and water, the scent of forest and plain, the ever- renewed feeling of spring that all is well, that all things can be done. And all was well. Throughout the winter the pier held firm. Not a timber was missing, not a crib had been moved. The stone fill was as firm as when it had been laid down. It began to look as if Buffalo would have a harbor after all. AS SAM WILKESON surveyed the work that spring, he decided the attempt of the formation of the new channel, must come before further work on the pier. About the 20th of May, laborers were engaged, and the pile driver put in operation. Two rows of piles six feet apart were driven across the creek, in a line with the right bank of the intended channel, and the space between these rows of piles was filled with fine brush, straw, damaged hay, shavings, etc. This material was pressed down by drift logs, which were hoisted into their places by the use of the pile driver. On the upper side of the work, a body of sand was placed, making a cheap and tolerably tight dam, by which the creek could be raised about three feet. The first job was to dam off the creek at the desired point. The dam was built on a line with the right bank of the proposed channel. Once it was erected, the water in the creek rose about three feet. With part of the channel dug, the sandbank at the western end of the dam was broken. The pent up waters rushed forward with sufficient force to scour out about 15 feet of the adjoining bank to a depth of eight feet. Then the dam was extended across the new channel. Again the water rose. When it was brimming over the top of the dam, another sluiceway was opened and the water rushed out again to do its work, and every dam full of water let off, removed hundreds of yards of gravel and deposited it not only entirely out of the way, but at the same time filled up the old channel. The process was repeated until the channel was pushed within a few feet of the lake. Through this ingenious method, Buffalo Creek cut its own way along the desired path. It seemed victory was assured. Then, without warning, a freak of nature struck and the victory became almost total disaster. WORK WAS PROCEEDING steadily, and when the new channel had been pushed to within a few feet of the lake, and the strongest hopes were entertained that the channel extended to the end of the pier, would make the harbor immediately available, the work was arrested by one of the most extraordinary rises of the lake perhaps ever witnessed. About 7 o'clock in the morning a tremendous swell suddenly rose in the lake. It was inexplicable. One moment the waters were serenely blue. The next a wave of gigantic size was roaring down upon the astonished workers. In a panic, men dropped their tools and ran for their lives. The wave struck the improvised dam with the fury of an enraged beast. The shoulder of water, traveling at frightening speed, blasted over the few feet of sand separating the works from the lake itself and flattened everything in its path. The logs which secured the materials in the dam were splintered. The east side of the dam shuddered under the impact and began to disintegrate. The west end, which was made of planks, was destroyed completely. The planks flew into the air like chips and the cracking of lumber could be heard even above the roar of the water. Working equipment was turned into a shambles. The pile driving scow, which had been moved to aid in the channel work, collapsed. The blind horse which furnished the motive power for the pile driver fell into the stream. From long habit, it persisted in swimming in circles and was rescued from drowning only, by a narrow margin. All the lumber, timber, piles prepared for use, with the boats, scows, and every floating article within the range of the swell were swept from their places and driven up the creek. THE SUDDEN SWELL was caused by a tornado which crossed the lake a few miles above Buffalo. So powerful was this wind that it cut a swath through timber on shore, felling even the stoutest trees. After securing the scows, boats and lumber which had been put afloat, the condition of the dam was examined, revealing the dam had lost its west end completely as well as 38 feet of the east end. In addition, the structure had been weakened throughout. The waters of the creek were now uncontrolled. They rushed through the dam with damaging effect. It was a hard blow and it was evident that unless repairs were made within 24 hours the entire project was doomed. But this was not the sum total of the trouble. In the wake of the tornado, a northeast wind commenced blowing, accompanied by a heavy rain and appearances indicated its continuance. Although a flood had been wished for, to aid in deepening and widening the new channel, the disastrous accident which had just occurred destroyed the only means of controlling it, and turning it to account. A freshet then, might open the old channel or perhaps enlarge the new one in a wrong direction, and even undermine the pier. But the rain increasing, and the weather being uncommonly cold, it was soon discovered that without a large additional force the dam could not be so far repaired as to resist the flood, which might be expected within 24 hours. The recent disaster and the importance of immediate help was communicated to the citizens, a large number of whom, as the rain fell in torrents, repaired to the dam. The pile-driver was put in operation to restore the breach at the east end of the dam. The rain beat heavily, sluicing over the men as they trudged to the dam. The dam was giving way slowly, running off in rivulets of mud. The creek beat against it from behind, the rain from above. Wilkeson assigned the men in groups. Some collected brush, others logs, others shoveled the crumbling earth back on the dam as fast as it was washed away. The work went on without pause. The weary men staggered over the soggy sand, bowed under their loads. And still the rain came down. Late in the afternoon a short break was taken for dinner. The meal consisted of bread and beer served to the men standing in the rain. Finally the rain slackened and stopped. Torches were lit and the labor went on in the flickering light. But the pace was beginning to tell. Men were falling away in sheer exhaustion. The creek was now a torrent. The headwaters and tributaries had felt the rain too. A mighty flow rushed toward the lake. But Slowly, the men gained on the crumbling dam. Their first effort was directed at preventing further damage. With that accomplished they worked to restore the dam as near as possible to its original condition. Slowly, the planks and logs and earthworks were re-built. The dam began to hold. The men retired to rest, after having been exposed to the rain, cold and water, for more than 12 hours, the battle was won. The work of destruction was halted. Without this help of the citizens, it would have been impossible to make the necessary repairs on the dam; with it, and by continuing the labor of the harbor workmen by torchlight until late at night, all was done that human effort could do to prepare for the flood. The rain, having continued through the night, in the morning the flood was magnificent. The strong northeast wind which had prevailed for nearly 2-1/2 hours had lowered the lake two or three feet, and added much to the effect of the water in forming a new channel. It wasn't until after the storm had subsided that Wilkeson and his men realized how great had been their victory. In stemming the disaster they had won more than they had bargained for. The torrent which had poured through the gaps in the dam had swept 20,000 cubic yards of gravel and heavy stone from the new channel bed. The creek was now flowing straight to the lake. More than that, the water had moved with such force that the stone and gravel had been carried out far enough out into the lake so that it could never again block the entrance. Had Wilkeson tried to remove the stone and gravel by hand it would have taken more money than was in the entire harbor fund. From the day the storm passed the channel of Buffalo Creek was 90 feet across at the bottom and 5-feet deep. 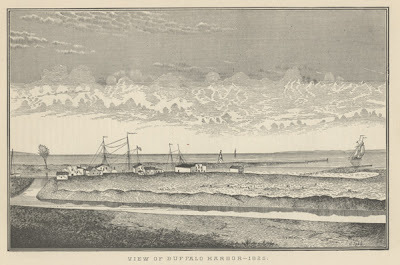 "From this time," Wilkeson later wrote, "small vessels could enter and depart from Buffalo Harbor without interruption and the entry of two or three vessels in a day excited more interest then, than the arrival of 100 large vessels and boats would now." SO THE HARBOR builders had succeeded. But that was not the end. The pier had to be extended to deeper water. A second pier was planned. Old troubles returned. The original $12,000 loan was exhausted. More money was needed. Townsend, Forward and Wilkeson made a public appeal. Scrip was issued, entitling the bearer to a pro-rata interest in the harbor. Over $1,000 of this scrip was disposed of, for a small part of which cash was received, but the greater part was received in goods, etc. Those who pledged to the fund knew they had small chance of getting their money back. It was called a loan, but actually it was a gift. Wilkeson decided to lay down a pier 200 feet long, several rods south and west of the pier already built, but in the same direction. This pier would form the western termination of the harbor. It was found much more difficult to erect piers in 10 or 12 feet of water, than in the more shallow water in which they were put down the preceding year. One difficulty attending the pier work was that of procuring a supply of stone. About 20 cords were required for each crib. The loose stone easily raised from the reefs near the harbor, had already been used, and now stone had to be brought from the Canada shore. Boats were scarce and the pile work proved to be a tedious and difficult job. An average of 100 strokes of the hammer were required for each pile. The interruption from the swells made it necessary to work at night during calm weather. The pile work was at length completed, but when secured in the best manner that could be devised, was a very imperfect barrier to the swell, and a very poor substitute for a pier. Improvements were made to the pier, adding stone where needed to reinforce, and ties six inches apart on the windward side for added security. By fall the pier was lengthened to 1,300 feet and reached water 12 feet deep. and all the Buffalonians Who Helped as Paid Workers and Volunteers Alike. Vollenhoven Ave. 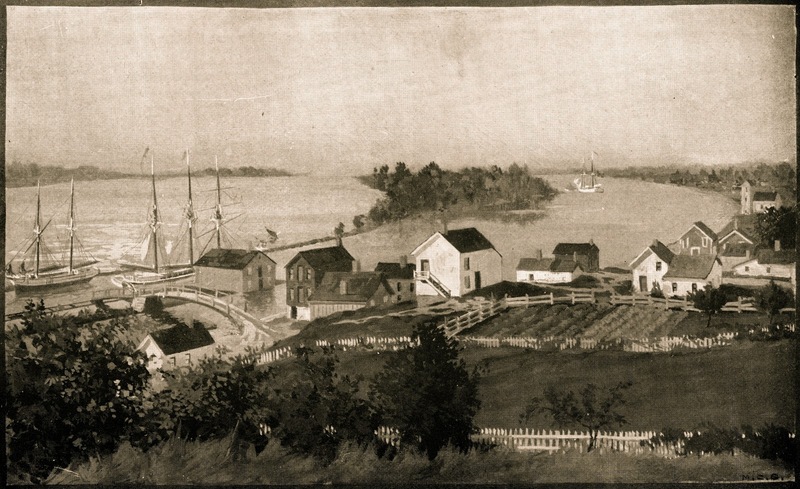 It was the first man-made harbor on the Great Lakes. Thus was completed the first work of the kind ever constructed on the lakes. It had occupied 221 working days in building (the laborers always resting on the Sabbath), and extended into the lake about 80 rods to 12 feet of water. It was begun, carried on and completed principally by three private individuals, Charles Townsend, Oliver Forward and Samuel Wilkeson, some of whom mortgaged the whole of their real estate to raise the means for making an improvement in which they had but a common interest. The harbor builders believed the next spring floods would so deepen and widen the entrance to the channel that even the Walk-in-the-Water could enter it. That now became their dearest hope. Their victory would be complete when the only steamboat on the Great lakes forsook its home Port of Black Rock and made Buffalo its home. But the Walk-in-the-Water was destined never to enter Buffalo harbor. It was through events surrounding the Walk-in-the-Water, however, that Buffalo finally was to win through to the place it had sought with such effort and valor. 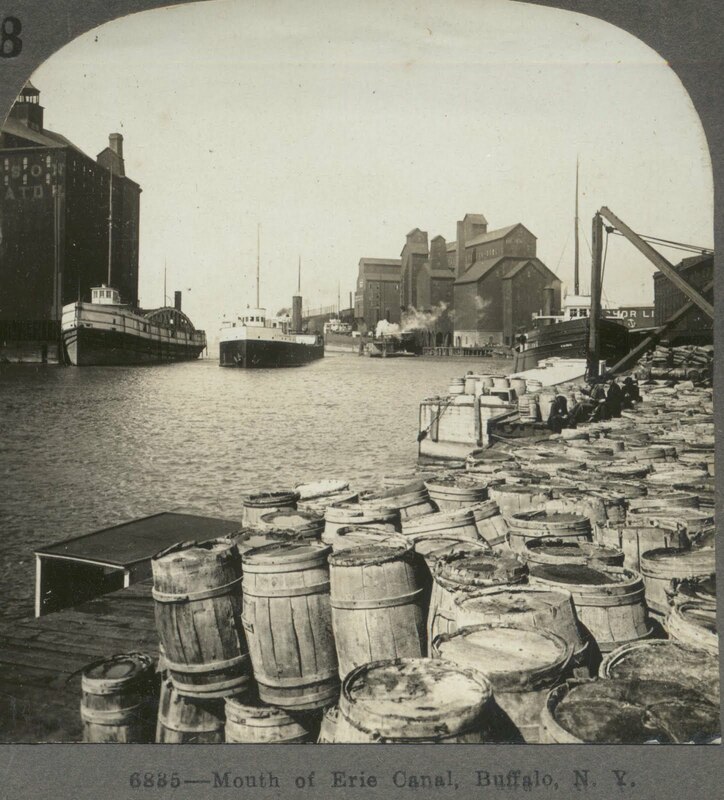 In all Buffalo's history no event was so significant to the future welfare of the city as the building of the first harbor. This task, carried on despite tremendous physical and economic obstacles, was an act of civic zeal unmatched in the later annals of the city. 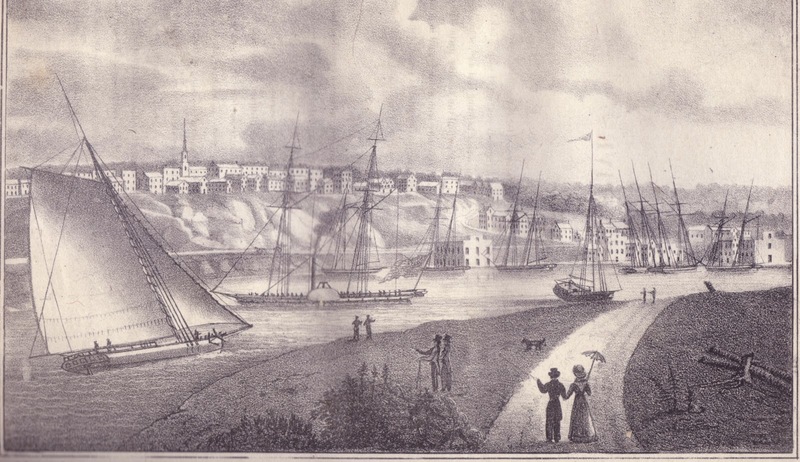 THE exact date in which the harbor work was begun is not on record, but it was some time before May 20th in 1820. The rains were heavy that spring when Sam Wilkeson got his cook shack and sleeping quarters built. Day after day, clouds hung in leaden-gray banks over the lake and then moved inland before the wind. The rain came in driving blasts against the village. The earth was sodden. Men sank almost to their knees in mud when they walked in the streets. INSIDE the homes of the frontier village, fireplaces were still lit against the dampness. Trees stood dark and forlorn in the rain, black with water, writhing in the wind. 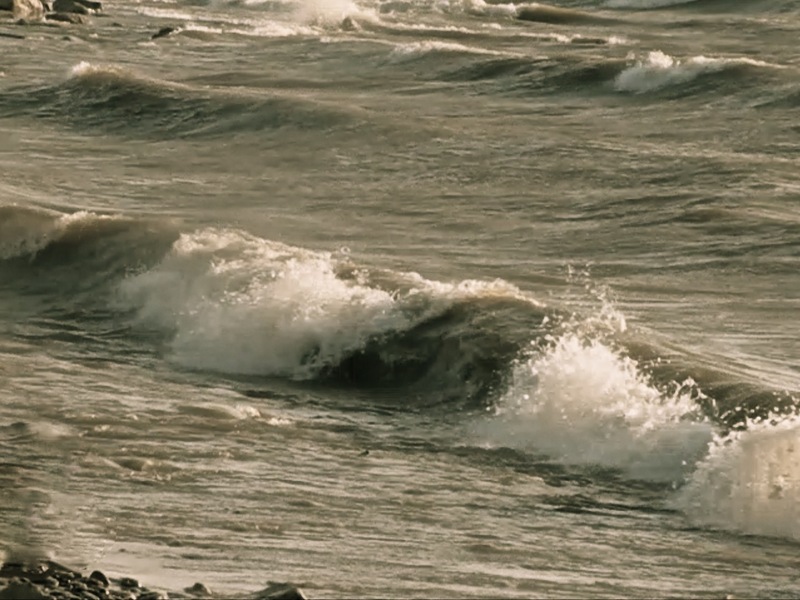 Against the lake shore, waves crashed in roaring spray as the wind churned the surface into, whitecaps which gleamed, even in darkness, like bared teeth. IT was not the kind of weather in which men liked to leave the snugness of their homes. The day after the cook shack and sleeping quarters were built, Wilkeson sent out a call for laborers to assemble at daybreak. Only a few responded. He called the work off. For several more days the project was stalled. Then, with characteristic determination. Wilkeson broke the bottleneck. He made a standing offer of $2 a month more than the regular wage, if the men agreed to work regardless of weather. The result was gratifying and the problem was solved. Thereafter the men worked six days a week, from dawn to sunset, with a half hour break for breakfast and an hour for lunch. There was little absenteeism and only one case of intoxication on the job. Almost without exception, the men who began the project worked through to the end. There were no fights among the workers. 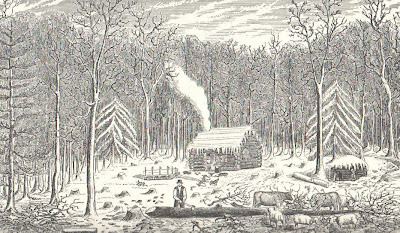 Wilkeson writes: “Two plans had been proposed for the work; One by driving parallel lines of piles and filling up the intermediate space with brush and stone, and the other by a pier of hewn timber, filled with stone. The latter plan was adopted. The timber intended for piles was used in the construction of cribs, three of which were put down the first day.” Since few tools were on hand, the cribs could be put down only when the lake was perfectly smooth. As far as possible, they were fitted on shore. The opposite timbers were made secure with six-foot ties bored and numbered and then floated to their places. There they were assembled. The trunnels, two feet long and made of oak or hickory, were driven home. It took an hour to put the crib together. On the same day it was assembled, it was sunk and secured with stone. But as he waded into the water to examine the worst damage, He writes: "Fortunately a little brush had been accidentally thrown to the windward side of one of the piers, which became covered with sand, and preserved this pier from the fate of the others." There he found the key to his problem. "Profiting by this discovery every crib subsequently put down was placed on a thick bed of brush, extending several feet to the windward of it." 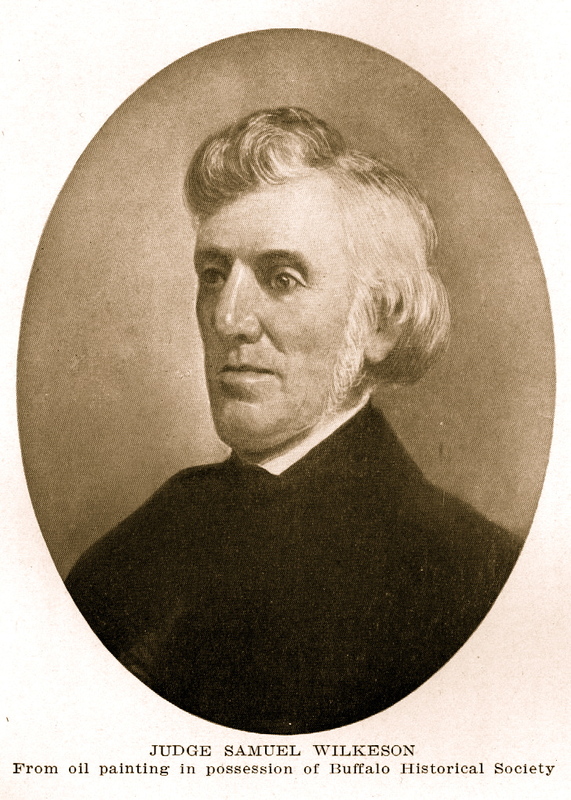 JUDGE Wilkeson's faithfulness to the underlying principle of the undertaking, economy; is indicated in the following paragraph of the record: "Neither clerk, nor other assistant, not even a carpenter to layout the work, was employed for the first two months, to aid the superintendent, who, besides directing all the labor, making contracts, receiving materials, etc., labored in the water with the men, as much exposed as themselves, and conformed to the rules prescribed to them of commencing work at daylight and continuing until dark, allowing half an hour for breakfast and an hour for dinner. Besides the labors of the day, he was often detained until late at night, waiting the arrival of boats, to measure their loads of stone, and to see them delivered in the pier, as without this vigilance some of the boatmen would unload their stone into the lake, which was easier than to deposit it in the pier." Heck, "I could do this blindfolded." THE improvised pile driver was pressed into use. It took 100 strokes of the old Army mortar to drive each pile to the desired depth. As the work progressed out into the lake a platform was built for the blind horse which furnished the motive power for the pile driver. The horse plodded round and round on the wooden planks; a few feet above the surface of the lake. Two months after the work got under way, Wilkeson hired a carpenter at $1 a day to build the timbering of the piers above the lake surface. By autumn the pier extended almost 800 feet into the lake and Wilkeson's crews were sinking cribs at a depth of 7 1/2 feet. As the pier-construction proceeded, and the deeper water was reached, "the cost of the work alarmingly increased." It was decided "to suspend operations for that year." Possibly they hoped to gather additional funds during the winter months. But if the future of the harbor was uncertain, in matters of money and of use, the builders had had the satisfaction of seeing that the cribs could make a harbor. ON SEPT. 7, 1820, the still incomplete project underwent it first test. The timber work was finished but the pier was only partly filled with stone. That afternoon two small vessels came under the lee of the pier and made fast. The captains went ashore to conduct some business. As evening approached, clouds piled in threatening banks in the sky. The wind rose suddenly. A storm was definitely in the making. Fearful that, if the storm came, the two vessels might carry away the part of the pier to which they were fastened. 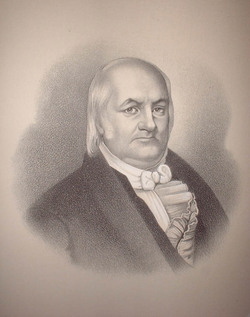 Wilkeson sought out the two captains and asked them to move the ships. But he was too late. While they were talking the gale broke. The wind drove spray like buckshot. The water seethed, waves, broke with a roar against the pier. 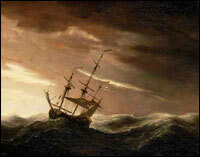 To move the ships now was impossible, unless they were simply to be cast loose and allowed to run on shore. 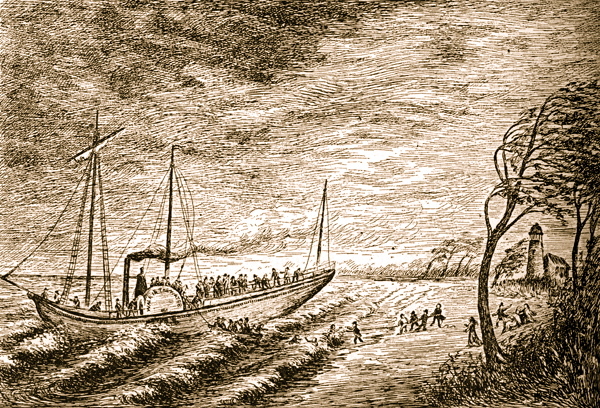 Despite the fact their vessels could be damaged seriously in the process, the two captains agreed to do-this if it appeared the pier would collapse. THE ships rose and fell in the pounding waves, crashing against the pier as the water bore down an them, pulling with tremendous weight at their lines as they rolled away. In the blur of wind and water, Wilkeson waited for the storm to pass. Then he saw for the first time how well the challenge of the elements had been met. Neither the pier nor the ships, were damaged. The next day the work of filling the pier with stone was resumed. The pier, which at this time extended 50 rods into the lake, was in a few days filled with stone, and the operations upon it suspended for the season." NOW another problem had to be met. The pier was only part of the harbor plan. The most difficult part was yet to come. This involved cutting a new straight channel for Buffalo Creek and it also was the most dangerous element in the entire operation. No one knew whether the plan for the new channel would succeed. If it did not, there was no additional money on hand to meet the emergency and the entire harbor project was doomed. AT that time, Buffalo Creek entered the lake about 1,000 feet north of its present mouth. For some distance it ran almost parallel to the lake shore behind a bank of sand. The new channel was to be cut across this sand-spit, thus making it possible for ships to sail directly from the lake into the creek without navigating the sharp bends. THE plan was to scrape through the sand, dam the stream, form the beginning of a new channel, and hope that spring floods would scour it to sufficient depth. Tools were gathered and a call went out for volunteers. The villagers responded quickly. Work was begun in November. The volunteers walked out over the sandpit, took their places along the route of the desired channel, and started to dig and scrape. But just a few feet below the surface heavy stone and gravel were encountered. The stone was of such size it was doubtful whether the spring freshets would carry it out to the deep water of the lake. If it was not carried far enough, it would serve only to block the channel at another point.It was late in the year. The wind was sharp and there were hints of early snow. The new problem, could not be solved in time. The scraping of the channel was suspended before water level was reached. It was something that would have to be resumed in the spring. But while all work had stopped, Wilkeson's worries had not. All during the remainder of the fall and through the winter, Buffalonians watched the pier with anxiety. Its fate was out of their hands and they could only wait. Snow, sleet and hail, the pounding of frigid waters, the razor-edged scraping and tremendous weight of ice, the winter winds which howled across the lake with unremitting fury--if the work should be destroyed by gales, or by ice, "the fund remaining would be insufficient to repair the damage. These were the challenges the pier now had to meet. By spring Buffalo would know the answer.